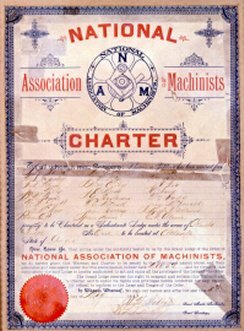 The National Association of Machinists founding charter, 1888. The International Association of Machinists and Aerospace Workers (IAM) was founded in Atlanta 125 years ago this coming Sunday. On May 5, 1888, nineteen machinists led by Tom Talbot joined together to found the Order of the United Machinists and Mechanical Engineers. Hoping to avoid detection from bosses at the East Tennessee, Virginia, and Georgia Railroad repair shops, their clandestine meetings took place in a railroad pit, hidden from sight at a railroad yard located at the intersection of Hendrix and Windsor streets, just south of the state capitol. The IAM will celebrate its 125th anniversary with an officer’s convention in Atlanta later this month. In preparing for the convention, the IAM wanted to locate the site of the original railroad pit with hopes of mounting a commemorative sign nearby. However, the railroad yard has been transformed into a metal yard for over ten years and union representatives were not sure if they could find the pit on the property since it had surely changed over time. Because Georgia State University Library houses the Archives of the International Association of Machinists and Aerospace Workers, I (in my capacity as archivist for the collection) was asked to join in the search for the railroad pit. 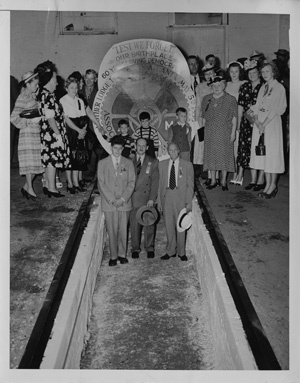 Making the search more difficult, the group knew the pit had been filled in with cement sometime between 1948 and 1963. 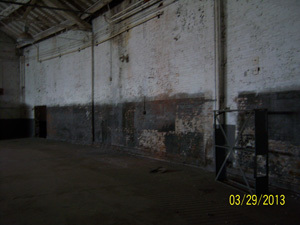 Using the union’s monthly journal, photographs, and documents from the union’s archives, we were able to narrow down which building might have housed the pit. 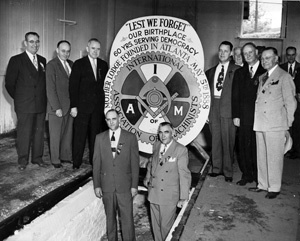 The IAM has continued to return to Atlanta for conventions and meetings throughout its lifetime, and in the early years they often made commemorative photographs in the pit. These photographs helped us identify architectural details in the interior of the roundhouse and compare them against the many buildings at the railroad yard which ultimately led us to the southernmost structure on the property. 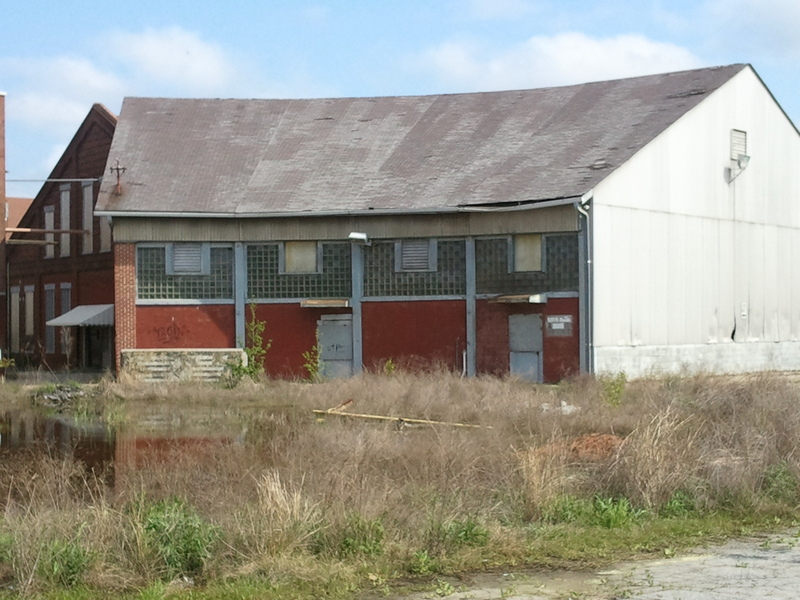 The building interior is not currently in the best shape because it has been abandoned for a while (most recently it was used to house a firewood business and before that it was turned into a shower/locker room for railroad workers). Additionally, not only had the pits in this roundhouse been filled in, but the whole floor has been cemented over, so we had no exact placement for the original pit. Current interior photographs do not provide much detail, unfortunately, due to poor lighting, so it is difficult for readers to see that windows and doors have been bricked-in and painted over. But in person we could see well enough to tell that the bricked-in windows matched the shape and size of those in the photographs: they were the same distance from the floor and had the same spacing between them as well. Needless to say, this discovery was very exciting for everyone as we had located the site of the original pit! The Roundhouse today; interior view. As part of Special Collections and Archives at GSU Library, the Archives of the IAM are most often used by students, scholars, and other researchers who are working on papers, books, theses, dissertations, or other major works. But as the IAM reaches its milestone of 125 years, we can be reminded that the Archives also stand as a testament to the union’s hard work and substantial history. Unfortunately, the railroad pit is not accessible to the public but if one wants to check out local IAM history, you can visit the Tom Talbot bust in Grant Park. 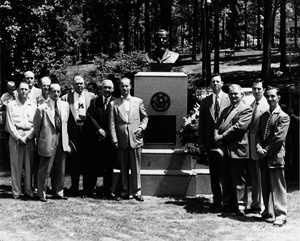 Located in the roundabout by the Atlanta Zoo and Cyclorama, the bust was erected in 1948 to commemorate the IAM’s first leader on the sixtieth anniversary of the union. Sixty-five years later, we still honor the founder of the union and all of the men and women that have carried on the work of Talbot since that auspicious May day in 1888. The Archives of the International Association of Machinists and Aerospace Workers is part of the Southern Labor Archives, Special Collections and Archives, Georgia State University Library. Special Collections and Archives is located on the 8th Floor of Library South and is open Monday-Friday, 9:00AM – 6:00PM. This entry was posted in Digital Collections, For Faculty, For Graduate Students, For Students, Special Collections & Archives, Uncategorized. Bookmark the permalink. Great job! As a 23 year Machinist Union member I can’t thank you enough for your efforts to preserve our great IAM history! As a 23 year IAM member I want to thank you for your efforts to preserve our great union history! Proud IAM member for 37 years! Proud of my union and thankful for those who blazed the trail and fought the hard fights in the beginning that established the middle-class in America.